Bees and wasps may seem the same in appearance and behavior, but bees are vastly different from their wasp and hornet relatives, including the type of nests they build for their colonies. Nests differ in building material, location preference and size. Hornets' nests are often exposed and covered with shells made of the same material as the cells. Only one true species of hornet is found in North America: the invasive European hornet. However, some species of wasps in the United States are commonly called hornets, such as the bald-faced hornet. Bees, wasps and hornets are fairly closely related; all belong to the order Hymenoptera. However, they belong to two distinctly different families: Colletidae, the bees, and Vespidae, the wasps and true hornets. Bees are furry in appearance due to the tufts of fuzzy hairs on their bodies. Bees tend to be rather dull in color: Browns, dusty oranges, dirty yellows and black are common. Wasps, on the other hand, are streamlined in appearance and often have brighter coloring. Like most nesting animals, bees and hornets need to find the perfect location to build their nests. For honeybees, this means a south-facing void with a volume that will hold at least 6 1/2 gallons, with an entrance hole no bigger than 1 1/2 inches in diameter. Hornets, on the other hand, often build their nests in trees, although different species vary. The bald-faced hornet, for example, is an aerial species who chooses to build nests in trees or shrubs, sometimes low to the ground. Many other yellow jackets prefer subterranean nesting sites. The building materials hornets and wasps use are much different than the honeybee. 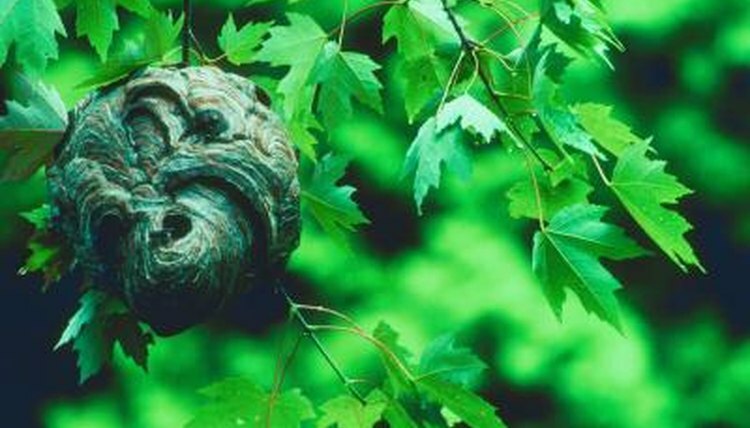 Wasps and hornets construct their nests out of a paperlike substance they make with chewed wood fiber and saliva. The wasps and hornets intricately design their combs and the outer materials of their nests using this pulp material. Honeybees, on the other hand, use beeswax -- a waxy substance they secrete from their abdomens -- to create their detailed and ornate cells and hive structure. The insides of the bees' and wasps' nests are different as well, but with a few similarities. Wasps, hornets and bees all construct cells in which they raise their young, one larva per cell through the pupal stage. However, honeybees have a little bit more to their hives than wasps do to their nests. Honeybees construct 100,000 cells, on average, in six or so combs. Typically, cells at the tops of the combs are for honey storage, followed by pollen-storage cells and then brood cells. The cells store the roughly 40 pounds of honey a typically colony needs to survive the winter. Is There a Kind of Bee That Doesn't Sting?